My first thought was, "WTF - are you kidding?" My second thought was, "A dictatorship of nerds doesn't understand the real world." This was in response to the removal of several television shows from Sohu.com, Youku.com, and other Chinese video streaming sites on strict orders from the PRC's State Administration of Press, Publication, Radio, Film and Television. It is merely another vain attempt by China's political leadership to control the minds of people within the Middle Kingdom. When they complain about "foreign content" they really mean "content which is beyond Communist Party control." Forget about having a choice. Forget viewership following merit.Viewership will follow what they are told to follow, right? Wrong! Wrong in China, wrong anywhere else where the people can connect to the internet. I didn't care much about the television shows in question, which had previously been under licensing agreements to stream from popular video websites. My issue was about control, as usual, and about enforcing my own intention to not let any state regulator dictate what elements of the press I could access or not access. Expert bit torrent users have long since enjoyed access to all sorts of media without censorship. Popular trackers carry movies, television shows, audio programs, and so forth. These are extremely difficult for service providers or governments to filter because the peer-to-peer traffic can be obfuscated and routed through unlimited IP addresses. But what is a tool worth if its use is limited to just a few experts or nerds willing to learn a difficult process? Could the process be made as easy as using Netflix or Youtube? Indeed, a better way was in the making. Several software developers responded to demand for an easy way to find and watch movies via bit torrent. UPDATE: Time4popcorn.eu version includes a VPN to thwart surveillance. 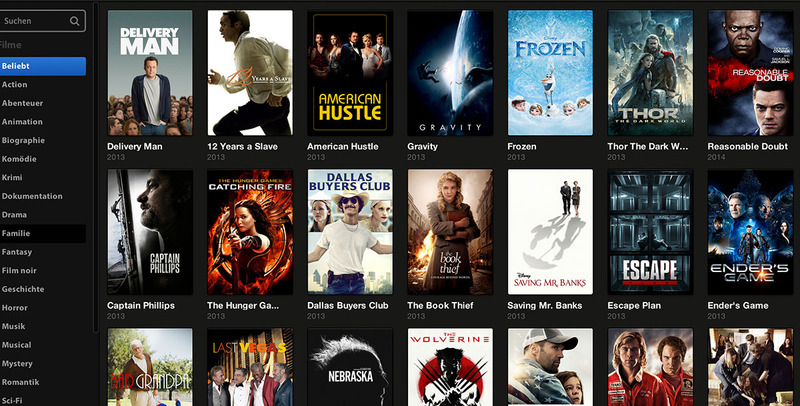 Popcorn Time was the first of a new breed of torrent streaming graphical user interfaces. The special thing about Popcorn Time is that it is simple and easy, with several tasks working behind the scenes. It uses the YIFY-TORRENTS application programming interface to get lists of movies or television shows on the torrent tracker. Opensubtitles.org's API is used to retrieve subtitles in any available languages. Data displayed about the movies or shows is retrieved from the Internet Movie Database. When the user selects a movie to watch, a bit torrent download is started, and the user watches the program. All of these components work together to make a seamles point, click, read, and watch experience for the end user. Popcorn time actually works quite well. I was able to pick shows based on release date, genre, popularity, and other criteria. After clicking on a particular item, another screen would come up with a description from the movie database and health of the torrent (number of seeders). There's also a listing of available subtitle languages. Screen resolution is selectable from the movie information screen - 720 or 1024 pixels in width. Playback is on the built-in player. As the torrent downloads, it favors chunks of data closer to the start of the file over chunks nearer the end. Therefore, one can watch from the beginning while it gradually downloads the middle and end of the movie. As long as the download progresses faster than the playback, the movie runs smoothly. If the torrent is in poor health (too many leechers / not enough seeders), or if the internet connection is slow, playback may sometimes freeze or stutter. UPDATE: FLIXTOR HAS BEEN DISCONTINUED - June 14, 2014. No guts, no glory. Flixtor was the next popular torrent streaming graphical user interface, arriving after the first version of Popcorn Time withered under attacks from opponents of bit torrent file sharing. 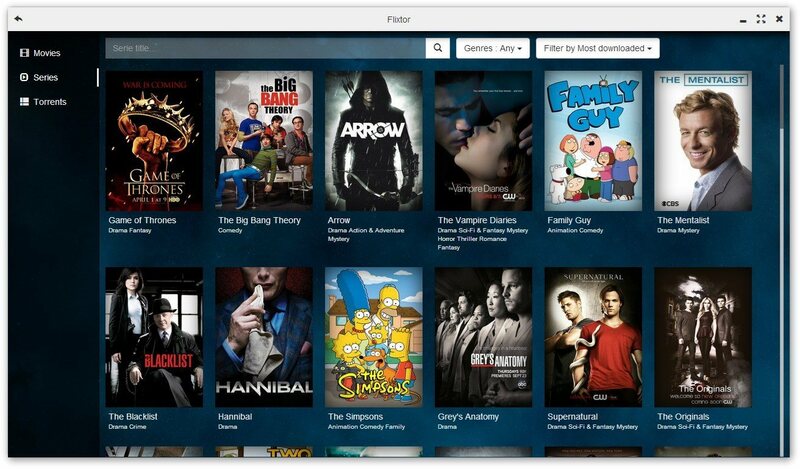 Flixtor is more polished in its presentation and easier to use than Popcorn Time. 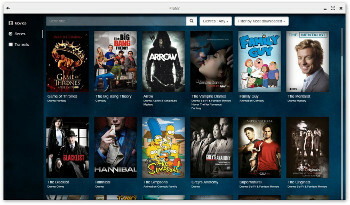 Flixtor uses the Torrentlookup application programming interface to get lists of movies or television shows on the torrent tracker. Opensubtitles.org's API is used to retrieve subtitles in any available languages. Data displayed about the movies or shows is retrieved from the Internet Movie Database. When the user selects a movie to watch, a bit torrent download is started, and the user watches the program. All of these components work together to make a seamles point, click, read, and watch experience for the end user. Flixtor works nicely indeed. I was again able to pick shows based on release date, genre, popularity, and other criteria. Categories are arranged somewhat better than in Popcorn Time. After clicking on a particular item, another screen would come up with a description from the movie database. A listing of available subtitle languages can be checked after playback begins. Often there are different versions and sources of a video. Flixtor lists them as part of the description - screen resolution, seeds / leechers, file size, etc. As the torrent downloads, it favors chunks of data closer to the start of the file over chunks nearer the end. Therefore, one can watch from the beginning while it gradually downloads the middle and end of the movie. As long as the download progresses faster than the playback, the movie runs smoothly. If the torrent is in poor health (too many leechers / not enough seeders), or if the internet connection is slow, playback may sometimes freeze or stutter. Playback is either on the built in player or VLC, if VLC is installed and chosen by the user. Torrent streaming projects are killed quickly by threats of legal action, government censors, and other soul-less entities. If you find these applications useful, do yourselves and the world a favor: copy and preserve the source code. Most of them have space on Github. As one project fizzles out, another uses the source code and makes a fresher and more robust torrent streaming application. 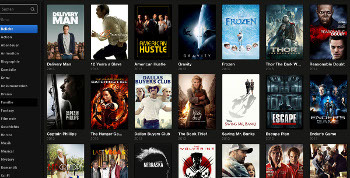 Originally, there was Popcorn Time, for example, then Flixtor. Following Flixtor, Isoplex, FlicsTor, and others have arrived on the scene - each one just a bit better than its predecessors and often using a different torrent tracker's API. XBMC Media Center Torrent Plugin. UNTV Open Source DRM-Free Media Center Platform. One thing notable about using Popcorn Time and Flixtor, or other torrent streaming applications within China is that download speeds can be quite high for healthy torrents. It seems that the throttling applied to traffic from foreign IP addresses is irrelevant for torrents. Sure, an individual seeder IP may be choked to permit only a few kilobits per second. If there are several hundred seeders for a movie, the movie arrives at several hundred kilobits per second - and the Great Firewall of China fails miserably! Rarely is the Chinese internet, built for surveillance and control, so fast and broadband as when it is subject to bit torrent traffic. Remember, the GFW attacks specific protocols from specific addresses and ports. Call a file from hundreds of seeders and the censorship is completely defeated. Some internet service providers block bit torrent traffic. There's a way around that too. One can use a VPN to conceal the traffic content from the local ISPs. One can also set the software to use randomized ports for the traffic. Protocol obfuscation, as used in uTorrent, Transmission, and other raw torrent downloaders, is one area that should be addressed in future versions of these programs to make them resistant to the most determined censors. Disclaimer: Some of the material available for streaming via the torrent APIs in Flixtor and Popcorn time may be restricted by copyright or local laws. You bear all responsibility for what you download and watch. This website discusses technology behind these programs, but cannot help you if you are reckless and get busted. Use a VPN to protect your privacy and anonymity. Do not keep copies of prohibited content on your computers!